The Greater Carroll Gardens, Cobble Hill and Boerum Hill area, otherwise known as Bococa, is loaded with places to unload your pocketbook. In this, our first “Best of Bococa,” (click the link for our full list), South Brooklyn Post hopes to highlight some of the greatest places to eat, drink, shop and hang out. If we’re going to spend time and money, let’s spend it wisely. While it is unusual for such common annual lists to point out the “worst” in local businesses, lest the editorial board infuriate a potential advertiser, let us just say that since we don’t make any money here at South Brooklyn Post, and, therefore, this magazine is in effect a labor of love and truth (or something), we have nothing to lose. Ah, the beauty of it. The multi-national Rite Aid outlet on Smith and Warren Streets affronts our senses with this broken down sign, among a long list of insulting businesses practices. Tie: Rite Aid on Smith Street at Warren, Rite Aid on Court and Atlantic Ave., and United Artist Movie Theater on Court. Oh, where to begin. Let’s start with Rite Aid: The long lines; the disorganized, crowded and low-quality offerings; the sometimes rude or simply not-present workers; the long lines; the dirty musty isles; the headache you get whenever you must visit a Rite Aid, or, for that matter, a CVS, in our local area. Why must this be so? Surely many, like myself, would rather give our business to the very rare and wonderful local pharmacies — such as Wyckoff Pharmacy on Court Street — that dot our neighborhood, then trudge into the Rite Aid. Spending a few extra dollars at Wyckoff Pharmacy or Clinton Apothocary is worth every penny, if nothing else to avoid the depressing experience of visiting a Rite Aid. These places need a thorough, thorough overhaul, and their staff need to be trained in customer service. 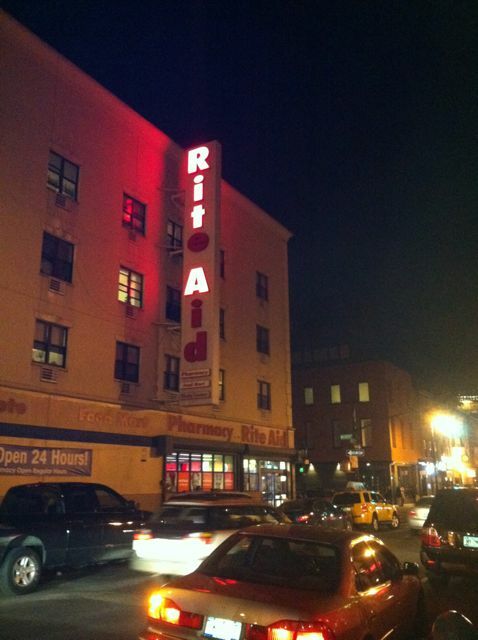 Please, Rite Aid, treat Brooklyn right. And then, the United Artist movie theater on Court Street. This place is truly amazing in its brazen disrespect for its patrons. On a recent Saturday evening visit to see the new James Bond flick, as always, the hordes are forced to throng into packed lines in a tiny lobby to buy tickets, while others push through to buy with a credit card from the machines. There’s always a confused crushed mash-up to get into the theater. Then, one ticket-taker to serve everyone. But the concessions, the concessions boil the blood. There’s no imagination here in what’s offered — fried buffalo chicken nuggets, nachos, soda and popcorn. Nevertheless, I’m one of many that needs popcorn and Coca-Cola when I’m at the theater. We went to the fifth-floor, where our film was getting shown, only to realize that there was one single woman to serve popcorn and soda to a line that quickly grew to more than a dozen patrons. So, my husband went to save seats while I stood for some 20 minutes in line. Luckily, we were 30 minutes early. The woman serving was doing a fine job, but one person can only fill one popcorn bucket at a time. Don’t theaters make all their money on concessions? Myself, I’m hard-pressed to stand in a 20 minute line, especially with the movie starting at any moment. Finally, the air conditioner must have been broken in the theater, for the temperature rose as the film progressed, until many patrons left in a sweat when the credits ran. The theater is owned by Regal Entertainment Group, which operates the largest theatre circuit in the United States, consisting of 6,899 screens in 544 theatres in 38 states and the District of Columbia, with over 211 million attendees in 2011. Come on Regal! We certainly want the local movie houses to survive, but let’s up the quality here. Rite Aid, and United Artists, show us some love. It’s funny, isn’t it, that the businesses that are the very biggest, and serve the most diverse populations, are absolute stinkers when it comes to customer service. They are begging us to boycott. Perhaps we should. Can you add to this list the person complaining about the smell of roast coffee at D’Amico’s?